His forth album traces his travels in sound. It’s a testament to his Gambian roots, impactful life abroad, and his mastery; it is also the personal statement of a man engaged in the world. Bassist Preben Carlsen and drummer, Stefan Pasborg, are the other members of Jobarteh’s working trio, playing prominently when called upon and allowing Jobarteh berth for his solos. The trio is visited by African percussionists and vocalist Souleyman Faye. I Met Her by the River is a rewarding ramble—through an ancient Danish folk song, to a take-off of Adele’s "Hello," a number of traditional compositions including three of the maestro’s own, and a flight of fancy off Mongo Santamaria’s "Afro Blue." 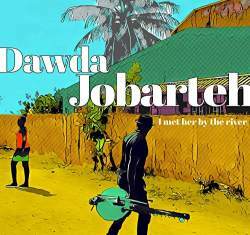 Despite the globe-, history- and genre-spanning playlist, Jobarteh still seems to find stillness. It is the stillness of arrival, perhaps. There is an urgency and a story told in his piece, Begging Boys, that draws you to the song from the outset. It is a lament and a call to act, a plea to end the practice of sending young male children, mostly from Senegal, and known as talibés, to live away from home in Koranic schools where they must beg in the streets for their keep, eight or more hours daily, often dirty and tattered, while soliciting money to sustain the schools. The vocal lament shared between Jobarteh and Faye is raspy and tender, imperious and supplicating at the same time. The kora is another petitioner, invoking the ancient-sounding melody to contextualize the controversial practice. "Jeg Gik Mig Ud En Sommerdag"
A 17th century Danish folk tune, “Jeg Gik Mig Ud En Sommerdag” (I Went Out on a Summer Day), is reworked into a slow jazz ballad, with Stefan Pasborg’s brushes, accented by his high hat, painting a filmic idyll alongside the kora’s evocative and lute-like delivery of the melody. Jobarteh’s solo covers Adele’s "Hello,” sensitively reworked as a Baroque and languid rather than anguished tune. The interpretation is quite beautiful. Rather than mine the singer’s desperation, he demonstrates a keen interest in exploring the melody, keeping the tenor somber but not doleful. His gentle shifts in tempo and dynamic seem almost improvised, as he embraces a melody that has clearly captured him. At the other end of the spectrum is “Afro Blue,” dropping as if from space, as Jobarteh sets his kora into electric guitar mode and through myriad effects—bending notes, echoes, distortion and more—over Manding percussion. He seems to be channeling the fun and electronics of Orchestra Baobab’s erstwhile guitarist, Barthélemy Attisso, who’d been home-schooled by Jimmy Hendrix, Carlos Santana and the like. The traditionalists might be seething, but this is a dynamic tapestry and a joy(ous)-ride.